Published: Aug. 31, 2018 at 12:39 a.m.
Los Angeles Chargers running back Detrez Newsome finds open space on a kick return and takes it into 49ers' territory. Published: Aug. 25, 2018 at 08:48 p.m.
Los Angeles Chargers running back Detrez Newsome follows his blocks on a 5-yard TD run and celebrates with a flip. 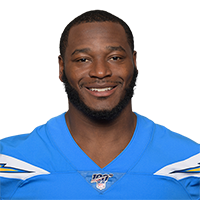 Published: Aug. 12, 2018 at 12:51 a.m.
Los Angeles Chargers running back Detrez Newsome rushes for a 6-yard touchdown.